I’ve been enjoying reading Adam Nicolson’s book “Sea Room” about the Shiant Islands in the Hebrides. The history of the small group of islands that he owns obsesses him. He charts the archaeology and natural history of the islands, and the book is filled with the characters who are the real owners of the place – the crofters and shepherds that work the land as tenants witinn the strange Scottish systems of private land ownership. When I was on Iona last month I was also struck by how somewhere so remote was at one time the focus of a mass pilgrimage. In the 15th century thousands of people travelled every year to visit the relics held at the Abbey there. When you look at a map of the Hebrides, you can see that these islands are beyond the ends of the world, connected as it is these days by roads. To get to Iona from Glasgow involves two ferries and when you’re finally there, you’re much closer to Ireland than to Glasgow. But Ireland is away across the sea. You can’t get there from here. Yet, it wasn’t always that way. When the traditional cultures and communities of the Hebrides were strong, families rowed and sailed through the islands for work and trade and spiritual reasons. 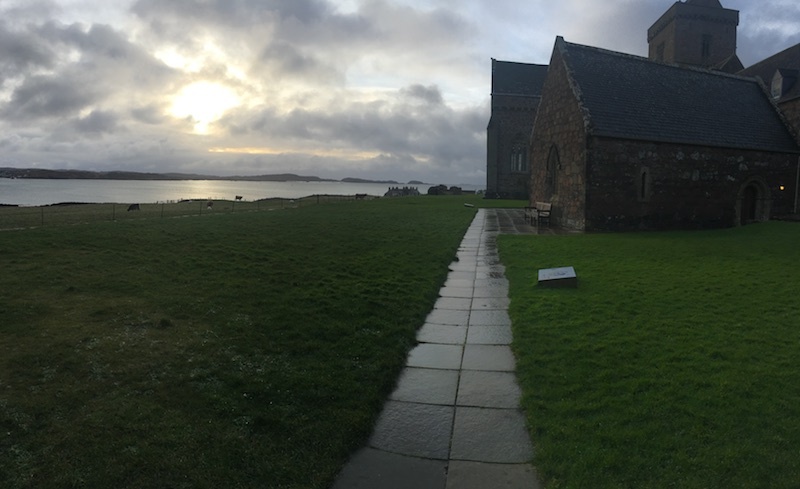 For a culture based on the sea, places like Iona are at the very centre of the world. The abbey at Iona was as important and accessible to worshippers as St. Paul’s in London, or The Vatican. During the period of most recent colonization, since the late 1700s, Hebridean culture ended up on the margins of the world. Travellers like Samual Johnson visited and wrote patronizing books about the lives of the people huddled together in large communal blackhouses, shared with their animals, surviving on meagre soils, livestock and fish. The colonizers paint a picture of Hebridean communities that need saving. This same strategy – of decentering a culture and a world – happened on the west coast of Canada too. Place like Bella Bella, Kitkatla and Wuikinuxv all which are considered remote now. They are inaccessible by car, and can only be reached by water or air. But the Heitlsuk, Tsimshian and Wuikinuxv peoples are canoeing cultures. Traversing the waters of the central coast was never a big deal. Bella Bella sits right in the middle of the BC Coast, a place of strategic importance between many different cultures. Until Europeans showed up and began building roads and cities elsewhere, these communities were the heart of the 9000 year history of human occupation on the coast. Almost overnight they went from places of immense importance to places of massive inconvenience. People were moved, villages relocated, children stolen and housed in residential schools so that the colonial governments could “care for” their wards. The result of course has been a massive seismic upturning of culture and power. That is being resisted today with increasing vigour, and on the central coast in particular, it is becoming obvious that the indigenous governments are the ones best equipped to manage resources, develop economies and protect marine and territorial ecosystems. This ultimately benefits everyone who lives in these territories, both indigenous and non-indigenous. The decentering of entire cultures is a core tactic of colonization. People that never needed help are suddenly cast as poor, disconnected and in need of aid for their very survival. What is needed instead is a recentering of the world on their communities and ways of life. Governance, ownership and leadership should lie with the people who best understand the land and seas. When that happens, the results are better for everyone. This is what reconciliation can be.